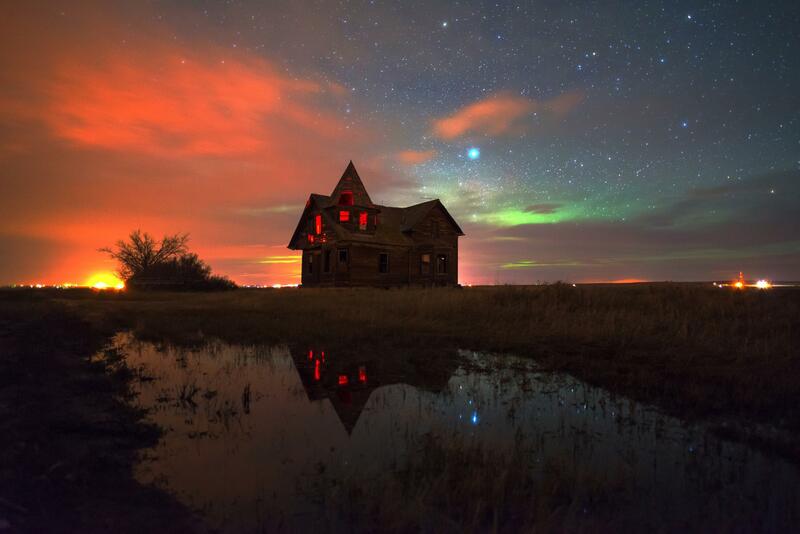 Captured by a photographer using the pseudonym Oklawolf, this forlorn house was found somewhere in the rural prairie providence of Saskatchewan, Canada. This artist, who specializes in photographs of abandoned buildings, has made many images along the Canadian countryside and beyond. With an aurora in sight and scatterings of oil fields shining in the horizon, Oklawolf used a Nikon D800 to capture this haunting silhouette. In order to capture the full range of reds, greens, and blues in this particularly peculiar night sky, he used a 25 second exposure at f/1.8. As a finishing touch, he entered the foreboding house and situated two red LED flashlights on the second floor, adding an extra pop of color and accentuating the reflection in a nearby puddle. Unfortunately, Oklawolf has to keep his story behind his images somewhat mysterious; he explains that when abandoned buildings go viral on social media, it often (ironically) leads to their destruction.